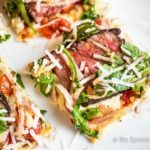 Steak and classic Bruschetta on a Flatbread Pizza! 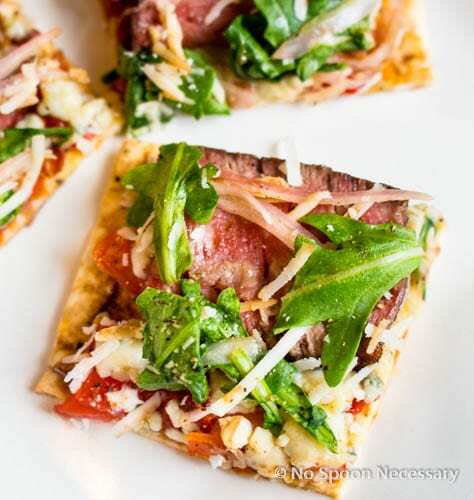 Thinly sliced steak with fresh bruschetta, gorgonzola, shallots, arugula tossed in Italian dressing and a drizzle of balsamic vinegar. 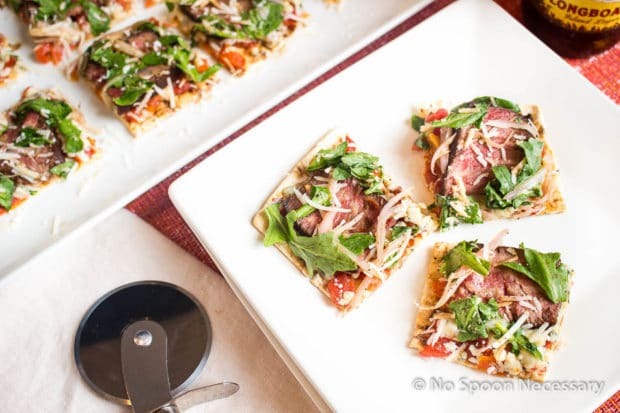 Give pizza night a fancy upgrade with this Steak Bruschetta Flatbread! tbread!Boy and I don’t go out to dinner. The last time we had dinner at a restaurant was to celebrate New Year’s with M.O.D. (My Other Dad), over 9 months ago. The last time Boy and I had a date night out… hmmm… I couldn’t even tell you with any accuracy. Maybe 2 years ago? Does this make us hermits?? Probably. But, we don’t care. I’d rather spend time with my husband in my comfy PJ’s, than get gussied up and have to leave the comfortable confines of my own home. While we may not dine out, we do order take out. Because, while Boy thinks everything I make is better than any dish a restaurant can prepare, sometimes this girl just does not feel like cooking cleaning pots, pans, dishes, and counter tops. Not that Boy won’t be on clean up detail, because he will… he is super nice like that. But, just making and seeing the mess… sometimes, I simply don’t feel like dealing with it. Those days = time to order some restaurant food to-go. Let them make the mess and do the dishes. 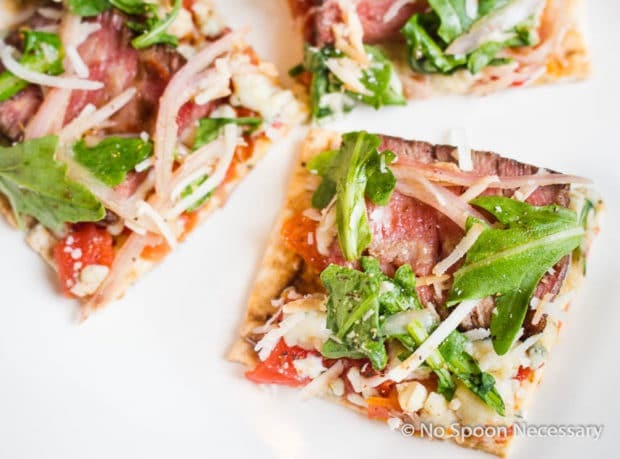 One place we sometimes order from is Brio Tuscan Grille. I love their beef carpaccio, salad, and steak bruschetta. 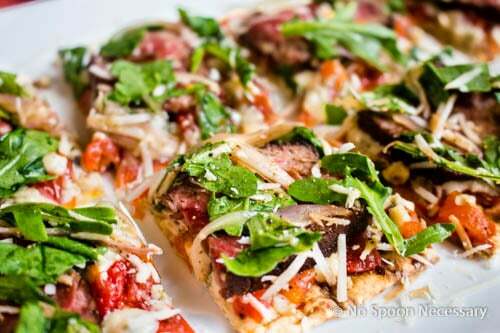 I decided I wanted to turn their steak bruschetta into a flatbread pizza, because well, why not?? Right? Less bready-carbs = more room in my belly for steak and roasted tomato relish deliciousness. Which = happy, happy; joy, joy! 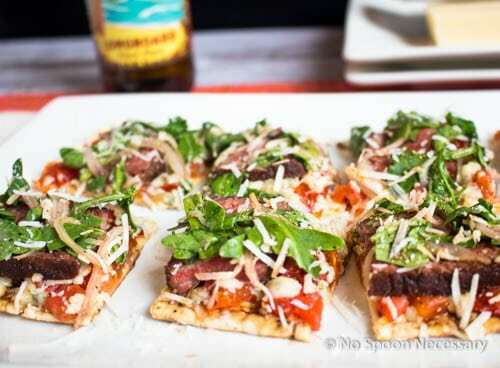 As it turns out, the steak bruschetta is actually WAY better as a flatbread. 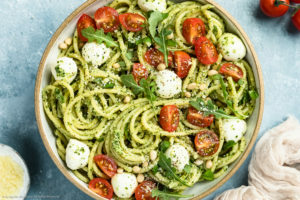 Not sure if anyone from Brio Headquarters is reading this, but suggestion for ya – you should totally add this version to your menu. 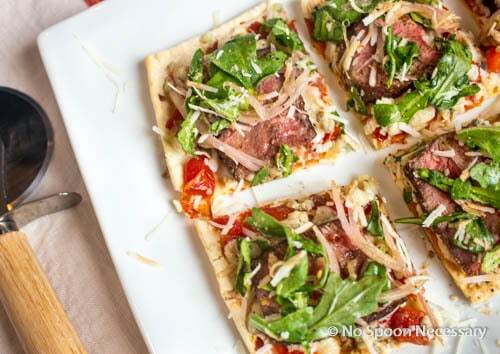 Feel free to call it NSN Brio Steak Bruschetta Flatbread Pizza. Or not. Just a thought. I used chateaubriand for my cut of steak, because that is what I had on hand (go ahead and dish out the jokes. Call me Mrs. Fancy Pants if you want, It’s all good in this hood). But, feel free to use filet, sirloin, rib eye… whatever you have or prefer. Just make sure not to OVERCOOK your steak!! 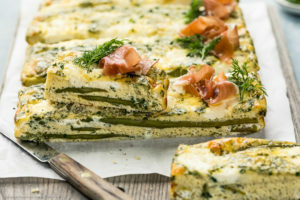 Keep in mind you will be slicing it, then topping your pizza, and putting it back in the oven to warm the cheese to a gooey, yummy in your tummy state. Therefore, you want to UNDERCOOK your steak when searing it in your pan. 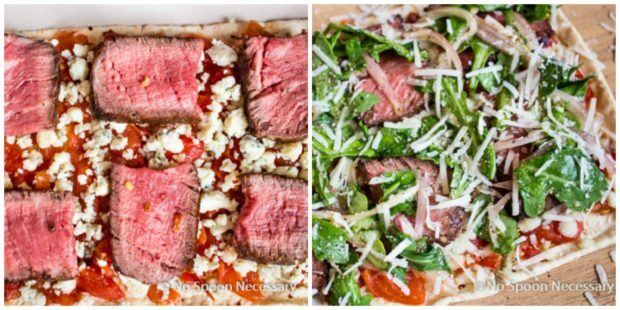 I cooked mine to about 110 degrees F. Because, I wanted my steak to be a nice mid-rare on my finished flatbread. 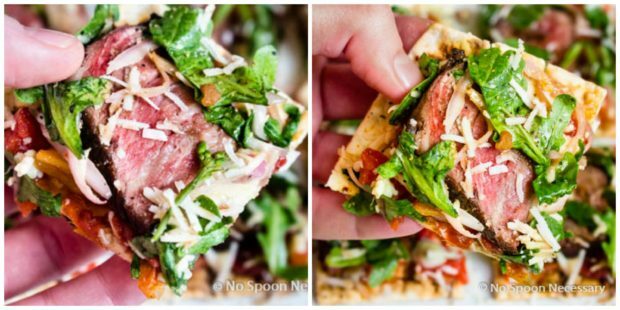 The pictures of this steak bruschetta flatbread really does NOT do it any justice, despite my valiant efforts to make it look beautiful. It is a hard pizza to make look pretty in a photograph, but who really gives a hoot when it tastes so gosh darn delicious?? 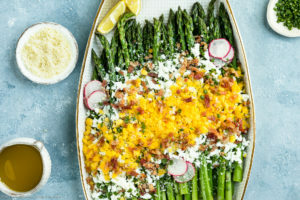 It seriously is out of this world and totally worth all the drooling that will be happening as you pull it out of the oven. 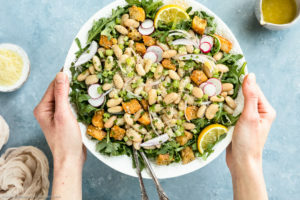 You really must make this, like yesterday. So whatcha’ waitin’ for?? Get that tookis in the kitchen ASAP and whip this together. You owe it to yourself. Remove your steak from the refrigerator and allow to rest on the counter for 30 minutes at room temperature. Make the Tomato Relish: Preheat the oven to 350 degrees F. Prepare a baking sheet with aluminum foil. Season cut side of tomatoes, generously, with salt and pepper. Place tomatoes, cut side down on baking sheet. Drizzle (or brush) the tomatoes with 2 tsp olive oil. Bake the tomatoes for 45-50 minutes or until the tomatoes are soft and slightly charred, rotating pan halfway through cook time. Change oven temperature to BROIL and continue to cook tomatoes for 3-5 more minutes, until slightly wilted. Remove pan from oven and transfer tomatoes to a clean work surface. Season, again, with salt and pepper. Set aside and allow to cool slightly, about 5 minutes. Roughly chop the tomatoes and place in a large mixing bowl. Add the rest of the ingredients and the remaining 1 tsp olive oil. Taste and adjust seasoning. Mix well, cover and place in the refrigerator until ready to use. While the tomatoes are roasting, cook your steak: Pat steak(s) dry and rub generously with extra virgin olive oil. Season, liberally, with Italian seasoning, salt and pepper. 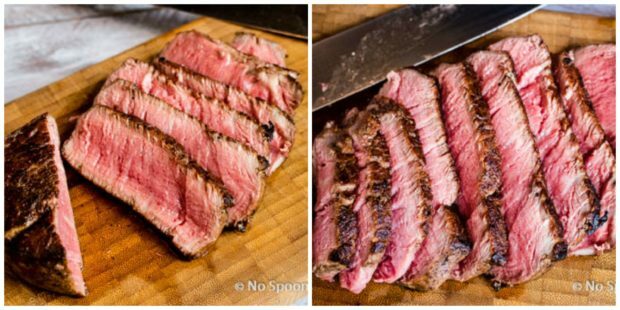 Transfer steak to a platter or plate and allow to rest at room temperature about 5 minutes. Transfer plate to refrigerator and allow to chill for at least 30 minutes, up to 2 hours. This will make slicing the steak evenly, and thinly, easier. While steak is resting: In a large mixing bowl combine the arugula, shallots and Italian dressing. Season with salt and pepper to taste. Toss well to combine. Set aside. Adjust oven temperature to 375 degrees. 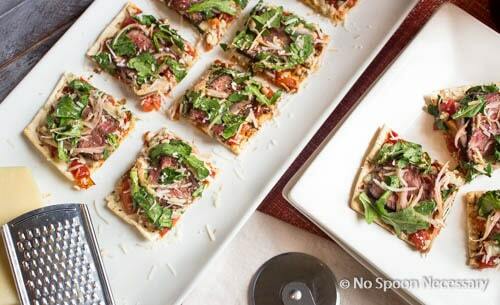 Place flatbread on an aluminum foil lined baking sheet or a preheated pizza stone. Place baking sheet, or stone, on middle rack in the oven. 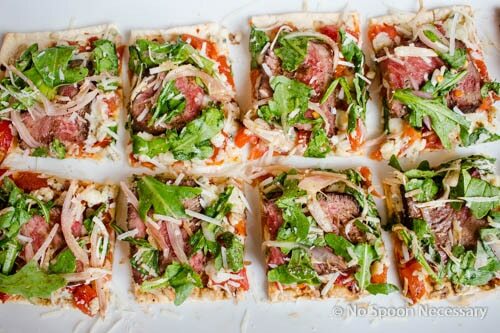 Pre-bake the flatbread crust for 2 minutes (or follow the instructions provided for your brand of flatbread). 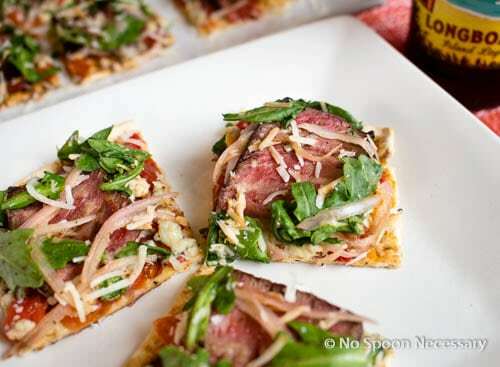 Spread 1/2 cup roasted tomato relish evenly over flat bread, sprinkle with gorgonzola and top with slices of steak. 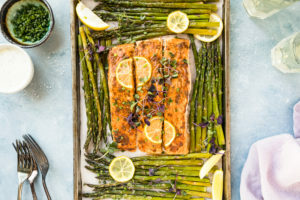 Place flatbread back into the oven, directly on middle rack, and bake an additional 4-5 minutes, or until flatbread is crisp and cheese is slightly melted. 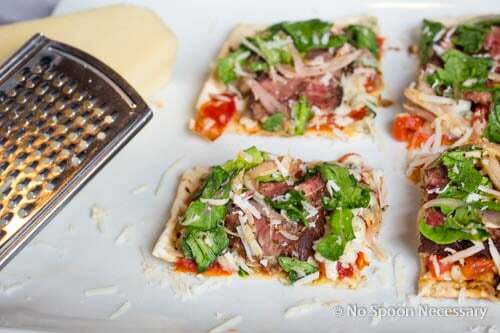 Remove flatbread from the oven. 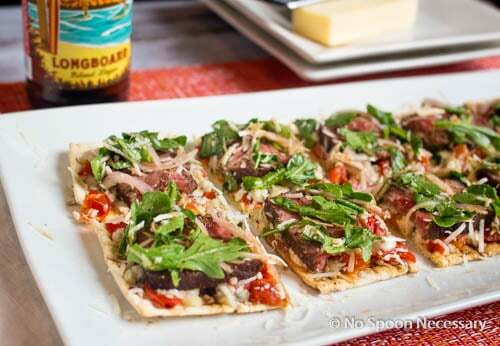 Drizzle balsamic vinegar evenly over flatbread and top with arugula mixture. 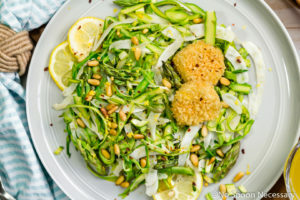 Sprinkle with Parmigiano. Season with cracked black pepper. Garnish with a drizzle of extra virgin olive oil, optional. *Read the entire recipe through FIRST. It will help the process move along much more smoothly. Of course you can not forget the wine 🙂 Let me know how you it turns out!